As the second BioBlitz approaches on 9 June our thoughts are turning to the wild plants and animals that find a home at the Botanics. An incredible 999 wild species have been recorded over the years, mainly through the efforts of Robert Mill. Common rock-rose was included in perennial wild flower mix sown in 2016 to create two small floral tapestry lawns as an experiment to encourage wildlife. As well as recording what we have living in the Garden the management of the Garden is being changed to make it even more wildlife-friendly. One particularly innovative experiment that is now demonstrating considerable potential is what I have called twenty-five square metres for biodiversity. This experiement involved stripping the turf from two twenty-five square metre plots alongside the Weather Station and sowing a mix of low-growing perennial wild flowers. This was carried out in 2016. Floral tapestry lawn with species-rich turf and standard lawn beyond. Today the plots are flower filled colourful patches in the otherwise pretty uninteresting lawns. Even plants that might be thought of as tricky to succeed with like common rock-rose and wild thyme are currently present in low numbers. 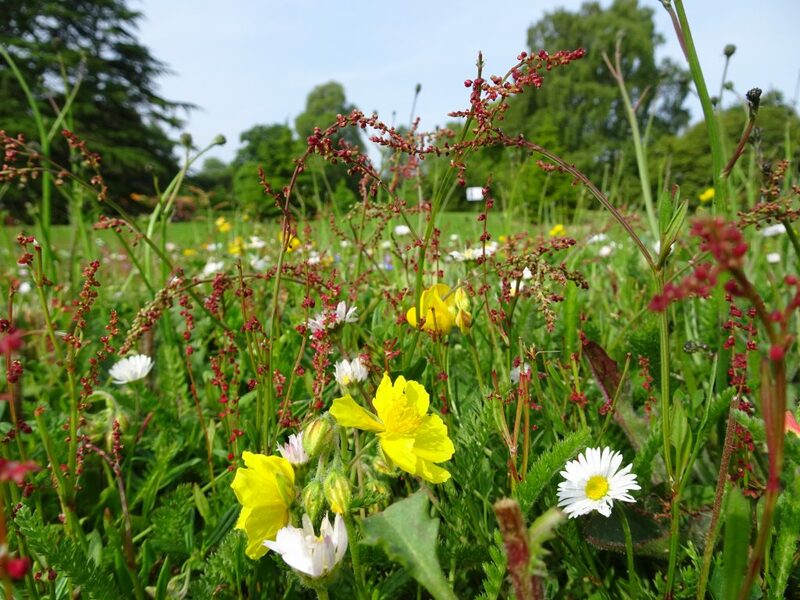 On a warm day the plots are alive with insects and manage to be both a valuable wildlife habitat and a lawn that visitors can walk across. This sort of treatment could be applied more widely to ammenity grassland and the experiment is a great example of the Garden’s demonstrating innovation. The original idea came from Leonie Alexander at the Edinburgh Living Landscape project. 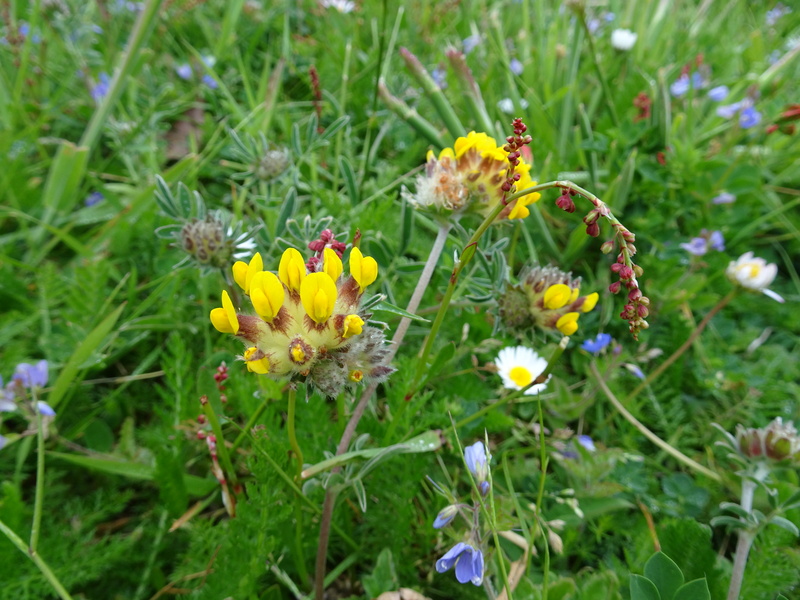 Kidney vetch has done particularly well in the plot furthest from the Weather Station. 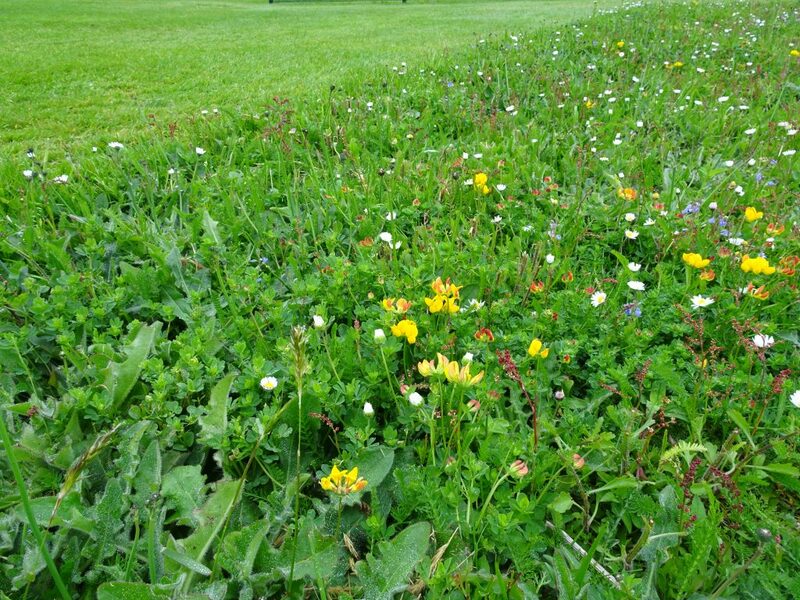 It would be fascinating to assess public opinion on the two patches, also aptly called ‘floral tapestry lawns’, as the potential to expand this kind of species-rich grassland is considerable.